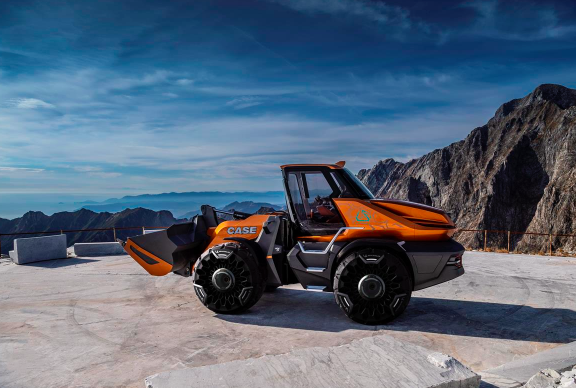 Case has a new methane-powered wheel loader concept – ProjectTETRA. Jointly developed by the CNH Industrial international design and Case engineering teams, this reflects both the increasing importance of alternative fuels, and demonstrates their viability: the concept wheel loader is powered by a proven methane engine, produced by sister brand FPT Industrial, and delivers exactly the same performance as its diesel equivalent. This is combined with cutting edge styling and an advanced operator environment, which makes extensive use of touchscreen and voice control technologies. Innovative safety features include biometric technologies together with an obstacle detection system, which is derived from CNH Industrial’s autonomous vehicle research and development program. Case has demonstrated the feasibility of this concept in a range of real-world environments as well as proving the business case, in terms of sustainability, reduced overall total cost of ownership and operational viability.